Without any doubt, Bluetooth is an amazing technology that helps people to pair devices together for wire-free and even for hands-free usage. But, among the many uses of this technology, file sharing is something that is overlooked by many people. If you have two phones with Bluetooth enabled, you can easily share files between the two devices. 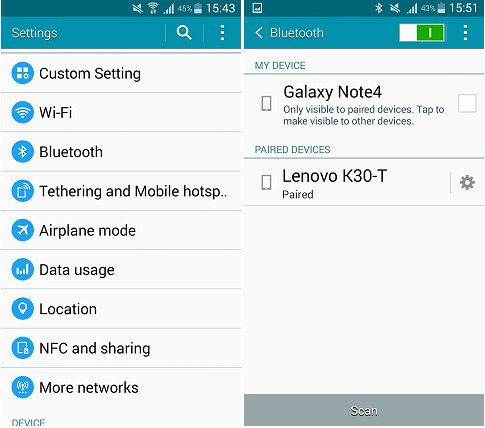 Here is a small guide that will help you on how to transfer files via Bluetooth. Turning on Bluetooth is the first step in the process. You can do the same in a couple of different ways. The first method is to pull down the menu of home screen, where you can find the Bluetooth switch option. The other method is to turn on the Bluetooth in Settings. The thing to remember here is that when you always keep the Bluetooth on, it will consume a lot of battery from your phone. So, once the file transfer is completed, just switch it off. The next thing you will have to do is to pair your Android and another phone via Bluetooth. Just visit the Bluetooth interface in your Android phone and just tick the checkbox next to the interface, so that both the devices will become detectable to each other. The phone will be scanned by the other. Once it is identified, the phone will show different Bluetooth enabled devices in your home, from where you should choose the phone you want to pair. Here, you might be asked to enter the security key for the Bluetooth device if there was a password added to the phone. Once both phones are connected, you can start sending and receiving files between them easily. As you are looking for file transfer from one phone to Android phone, the process will vary according to the operating system on the sending phone. However, most of the phones now have developed a user-friendly interface for easy file sharing via Bluetooth. The general process is that you will have to open up the Bluetooth application and should right click on the name of your phone displayed in the list of Bluetooth devices. Then, select the option send a file, which will open up the file menu, from where you will have to select the files that are to be transferred and click "OK". 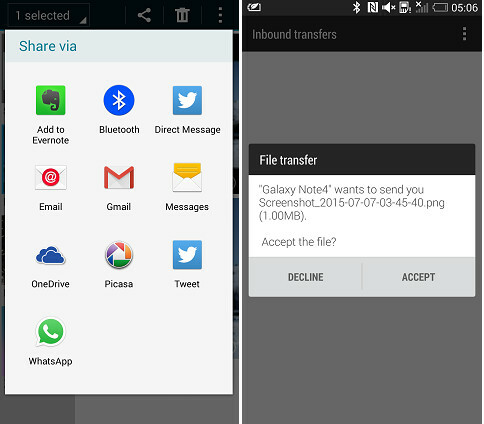 Now, your android phone will prompt you as to whether to allow or deny the files received. Just click on the OK button and the file will be transferred to your phone successfully. No all files are available for transfer via Bluetooth such as contacts or text messages. In this case, you need to look for other solutions. Phone Transfer is the recommended program to transfer data between different smartphones. It would be an Android phone, iPhone, Blackberry or even Windows phone. Besides phone transfer features, you can also use it to backup and restore phone data. The steps of file transfer are quite simple. Connect the phones to a computer via USB and select the files you wish to transfer. 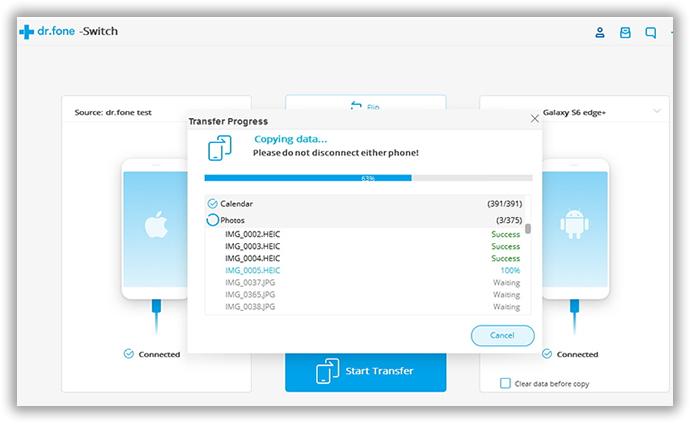 Click "Start Copy" button to start transferring data from one phone to another. I did a test with the program and it only takes 3 minutes to transfer 200 contacts and 300+ text messages.